Is your jewelry sold scented? All of our jewelry pieces are sold “blank”, without any oil added. You are welcome to wear them as is, or add your favorite essential oil to the black lava beads for a subtle aromatherapy experience. How do I use Essential Adornment jewelry? 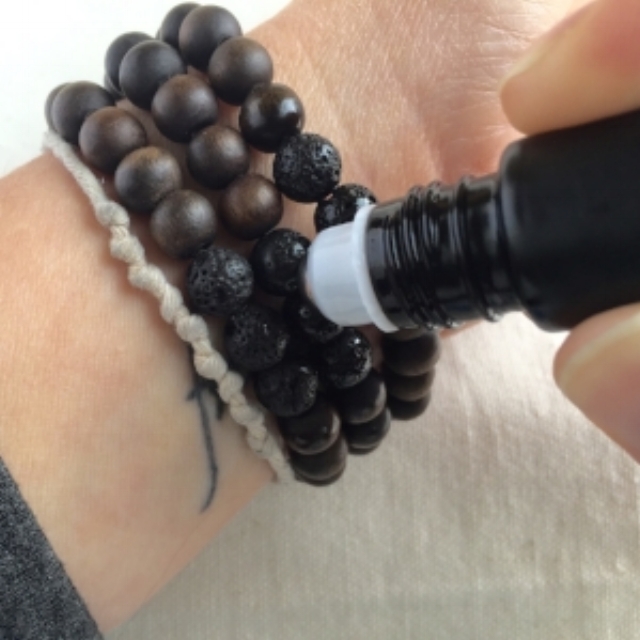 All of our jewelry is deigned using lava stones to diffuse essential oils. Add your favorite essential oil to the lava stones and your body heat will diffuse the scent subtly throughout the day. We suggest adding a drop of essential oil to your palm, then using your fingertip to apply oil to the lava stones, rather dropping the oil directly onto the jewelry to avoid adding too much. A little bit goes a long way and you can always re-apply. How can I add oil in a roller bottle to my jewelry? To add oils using a roller bottle, simply apply the roller directly to the lava. If the roller top doesn’t glide easily over the lava, roll in your palm and then add to the lava stones with your finger tip. The length the scent lasts will vary from oil to oil and stone to stone (all lava is natural, so variation is to be expected). Typically, the scent will last anywhere from 24-48 hours, sometimes longer. Citrus oils evaporate quickly, while others, like Vetiver, can last for multiple days. Until you are familiar with using your jewelry with oils, we suggest adding oils with your fingertip (rather than dropping oil directly on the lava) to avoid adding too much. Re-apply as needed, and feel free to layer multiple oils! Can I shower or swim with my jewelry? We don’t recommend ever showering or swimming while wearing your jewelry. Exposure to water can damage gemstones and weaken the stringing material.